This combination of images provided by Facebook shows a sample post featuring the social network's Reactions buttons. Instead of the "dislike" button many users have been clamoring for, Facebook is testing out buttons that represent the emotions of love, yay, ha ha, wow, angry and sad. Facebook is testing Reactions in Ireland and Spain starting Thursday, Oct. 8, 2015, with the hope of eventually rolling them out globally soon. 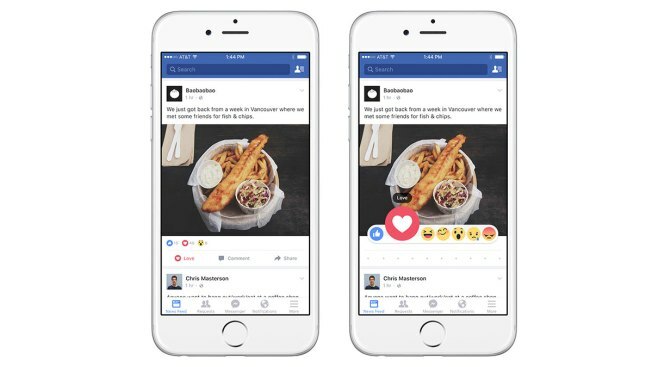 Facebook is going "Inside Out" on the Like button, adding a range of new emotional reactions to the iconic thumbs-up icon it launched in 2009. But Chris Cox, Facebook's chief product officer, says in a post that the company plans to use the feedback from the test run to make improvements, with the hope of launching the buttons globally "soon." Many Facebook users have been clamoring for the company to add a "Dislike" button for years, arguing that hitting the "Like" button in many instances — such as in reaction to a tragic news event — can seem a bit shallow, or even inappropriate. In order to see the buttons — which are available in the iPhone, Android and desktop versions of Facebook used in Ireland and Spain — users can either long-press or hover over the "Like" button. The buttons will then appear for users to scroll through and select.